After a good night sleep, we had breakfast before Elizabeth and I drove to Tacoma and parked in the Freighthouse Square Parking Structure. We walked to the Tacoma Amtrak Station and got our boarding pass for Car F. We talked with Bart and Sarah Jennings along with Greg Molloy. Bob Riskie joined us and we talked until the train backed in. We boarded Car F Amfleet Coach 82620. In 1941 the Southern Pacific took delivery of engine 4449 from the Lima Locomotive Works pulling the World Famous Coast Daylight between Los Angeles and San Francisco. The 4449 pulled the final steam powered "Daylight" train on January 7th, 1947. The 4449 saw commuter service during World War Two before running in freight service to end its service career on October 2, 1957 in Bakersfield, CA. The SP 4449 was donated to the City of Portland and placed in Oaks Park for the nearly two decades. On December 14, 1974 the SP 4449 was selected to pull the American Freedom Train in the western, midwest and southern parts of our nation during the American Bicentennial. On April 21, 1975 the 4449 was steamed up for the first time in 17 years and on May 8 made its first test run to Skamania, Washington with a trip to Wishram a week later on the May 14. On June 20 the 4449 left Portland to join the American Freedom Train. On December 20, 1976 the 4449 completed an 18-month, 35,000-mile trip in Florida operating over 27 different railroads in its journey. The 4449 ran a few Southern Railway Steam Fan Trips while in Birmingham waiting to return to Portland. On April 13, 1977 the 4449 left Birmingham on an Amtrak Steam Excursion home to Portland arriving there on May 1, 1977. It was repainted into SP Daylight colors for its trip to Railfair 1981 and a side trip to Los Angeles for Bicentennial Celebration there. In 1984 it pulled a round trip Portland to New Orleans called the World Fair Daylight. This 7,171-mile excursion was the longest in United States History. I rode the two day Phoenix to Los Angeles segment. The 4449 in 1986 ran to Los Angeles and the Eagle Mountain Railroad for the making of the movie "Tough Guys". In 1989 the 4449 return to Los Angeles for their 50th Anniversary of Los Angeles Union Station that included the side by side running with the UP 8444 into LAUPT. The 4449 ran to Railfair 1991, in 1992 it ran to San Jose for the NRHS Convention there, and 1999 it ran other excursions throughout the Pacific Northwest. The engine was painted black for the BNSF Shippers Special over their railroad. After 9/11 the 4449 was repainted into the colors it wore during its Freedom Train Days. 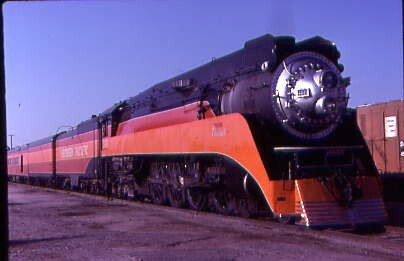 In 2004 the SP 4449 was repainted back once more into "Daylight" colors. In 2005 at the Portland, Oregon "Go by Train NRHS Convention" she doubleheaded to Wishram with the SP&S 700. In 2009 the SP 4449 went from Portland, Oregon to Owosso, Michigan for Train Festival 2009. The Tacoma NRHS Convention will be the SP 4449 4th NRHS Convention she has been at since her return to service. The train had a consist of the Southern Pacific 4-8-4 4449, Auxiliary Tender DLMX 4219, Amtrak Engine 202, Baggage/Concession DLMX 5659, Amfleet Coaches 82540, 82720, 82510, Cafe/Business Class 58107, Amfleet Coaches 82560 and 82620, Full Dome Nenana SLRG 511 800124, Short Dome Santa Fe Plaza Santa Fe 503 800392, California Zephyr Silver Lariat 800190 and Dome/Observation California Zephyr CZ10 Silver Solarium 800038. The cars were running in reverse order since they can't be turned at Easton. Only the SP 4449 will be turned at Easton. The train left Tacoma at 9:17 AM and left Tacoma for Easton. The Sounder rests for the weekend. The Sounder Connection Track to their Freighthouse Square Station. The train ran through Reservation and picked up speed. Views of the Washington Countryside. Next we ran through Puyallup and through the Sounder Station at track speed. The train ran next through Meeker and by the connection to the Meeker Southern Railroad before it ran through the Sumner Sounder Station. The train headed towards Auburn and we headed to an open vestibule. The train has reached the BNSF yard in Auburn. There is a BNSF loaded coal train sitting here as we passed by the yard this morning. The SP 4449 took the big turn at Auburn to get onto the BNSF Stampede Subdivision and I started onto the new mileage for me to Easton. We walked back to the baggage car before we returned to our seats. A pretty scene as we started up the line. A BNSF trackside detector stopped our train so our Amtrak crew had to walk the train and inspect it. I called Let's Talk Trains and then Stan Hunter stopped by to say hello. The train had an approach signal for Covington. The train ran through the forests along here before we ran through Covington. The train crossed 216th Avenue SE and at Henrys were the remains of the Pacific Coast Railroad Bridge on their line to Black Diamond. The train next ran by the siding at Ravensdale. The train continued through the dense forest with only a few openings. The train took the curve at MP 87. The view as we neared Kanaskat. The train has reached the CTC siding at Kanaskat where lumber cars are stored on it. The Green River. The train reached Palmer Jct where the line runs to Veazy. The southeast leg of the wye at Palmer Jct. A rare clear view of one of the peaks as we were now in the City of Tacoma Watershed. The Howard Hanson Reservoir as our train climbed higher into the Cascade Mountains. We would cross the Green River several times in the next few miles. An open area along our route through the mountains. Crossing the Green River on Bridge 64. The Green River at Bridge 60 before the train reached Lester with its 7,000 foot siding. We left the City of Tacoma Watershed. Buildings at Lester. We stopped at Lester for some broken down maintenance equipment to clear off the tracks ahead. After a few minutes I went to the vestibule for the ride to the Stampede Pass Tunnel. The SP 4449 at rest at Lester. View of the mountain east of Lester. Bridge 58.9 and our crossing of the Green River. The train crossed "The Viaduct" which is Bridge 56 a 1,121 foot steel viaduct, the highest on this line. View of the climb to Stampede. Interesting rock strata here along our route today. SP 4449 still climbing the grade. The train entered the snowshed then Tunnel 4, an 830 foot bore. View looking down from the mountains. The end of the Stampede Siding. The train entered the Stampede Pass Tunnel, which is a 9,434 foot bore, the longest tunnel on this route. The train exited the Stampede Pass Tunnel. Views to the north of our train now east of the summit of the grade which is just inside the tunnel. A pond on the southside of our train. Lake Easton signals our arrival into Easton, our destination for this trip. A Bear Car Shop Plaque on my Amfleet Car 82620. The passengers detrained in Easton.